All of the pictures on this website represent the moulds in approximately the correct proportion to each other with regards to dimensions. All dimensions relate to the overall dimensions of the moulds rather than the impressions taken from them. The largest dimension of any impression is typically about 90% of the largest mould dimension. We recommend using a 50:50 mixture of sugarpaste and flower paste. Using a lump judged big enough to just fill the mould, you press it into the cavity using your thumb and the heel of your palm, or a small rolling pin. Any surplus can be removed using a small artist's palette knife (use a sawing action from the centre of the paste outwards) to leave the paste flush with the surface of the mould. You should then be able to remove the formed impression by gently flexing the mould. Depending on the exact mixture you are using it should pop out cleanly. If there is any tendency for the paste to stick a light dusting of corn flour will help. Alternatively you can freeze the filled mould to harden the paste first. Note that some moulds with deep narrow cavities (such as the baby shoe moulds) can require significant care to both fully fill the mould and remove the model successfully. 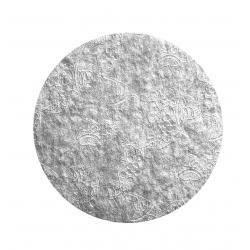 Silver 0.08" Embossed Round Thin Board - 4"
Silver 0.08" Embossed Round Thin Board - 5"